Since RecurDyn Version 7 R5 we offer a fully integrated mesh engine to directly support RecurDyn FFlex (Full Flexible Body Simulation) and also RecurDyn RFlex (Reduced Flexible Bodies). The RecurDyn Auto Mesher closes the last open gap in the process chain of the RecurDyn Multi Flexible-Body Dynamics technology. Complex system level simulations including component elasticity can now be build-up and performed completely inside RecurDyn without the need for an external FE program. 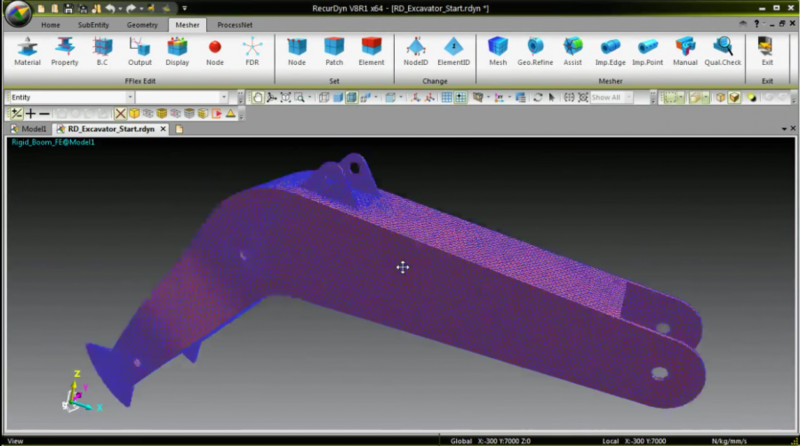 To finally complete the integration of Multi Body Dynamics MBD and Finite Elements Analysis FEA in RecurDyn the level of compliance (Rigid, RFlex or FFlex) will be just a user switchable property of a generic body, breaking up the traditional distinction between Rigid Bodies and Flexible Bodies as still being utilized in conventional Multi Body Dynamic MBD software. In the first version the auto-mesher supports solid and shell element meshes. It also comes with a build-in logic to analyze and efficiently model the connectivity areas between flexible and rigid structures in the model.